Nepal’s decision to skip the BIMSTEC military drill has posed a big question mark over the Indian government’s diplomatic adventurism pushing for the revival of the seven-member BIMSTEC in place of SAARC (South Asian Association for Regional Cooperation) in a bid to marginalize Pakistan in the region. Nepal and Thailand are participating only as observers in the "Milex-2018" anti-terror military drill which began in Pune, India on Monday. While Nepal pulled back from the drill following strong protests from political parties in the country, including that of ruling Communist Party of Nepal; Thailand cited "prior commitments" as the reason for not attending. The drill is an initiative proposed by India to strengthen the joint anti-terror mechanism of the seven-member BIMSTEC (Bay of Bengal Initiative for Multi-Sectoral Technical and Economic Cooperation) that includes India, Bangladesh, Nepal, Myanmar, Bhutan, Sri Lanka and Thailand. However, many see it as India's effort to further dilute the relevance of SAARC in order to isolate Pakistan. The Nepali Army earlier confirmed that it would participate in the drill. However, only three days prior to the commencement of the drill, Prime Minister KP Oli, conveyed to the army that Nepal's participation was being canceled. Oli's decision is understood to have been prompted by strong oppostion from political parties including his own Nepal Communist Party (NCP), widely considered pro-China. After pulling out of the drill, the Nepali government clarified that it had been proposed by the Indian Prime Minister Narendra Modi but was not unanimously endorsed by all members during the BIMSTEC summit. "India was free to float the agenda, but we did not endorse it," Nepal's Minister for Foreign Affairs Pradeep Gyawali said last week, arguing that BIMSTEC is purely a developmental forum. Analysts say that geostrategic imperatives, security dialogues, or counterterrorism cooperation initiatives are no substitute for BIMSTEC's primary mandate to increase regional connectivity. "(There are) many reasons behind Nepal's decision to pull out of the BIMSTEC military exercise, most of which (are) without merit. But this should also serve as a lesson for India about the limits of security cooperation, bound to weaken the organization," Constantino Xavier, Fellow in Foreign Policy Studies at Brookings India in New Delhi, writes. 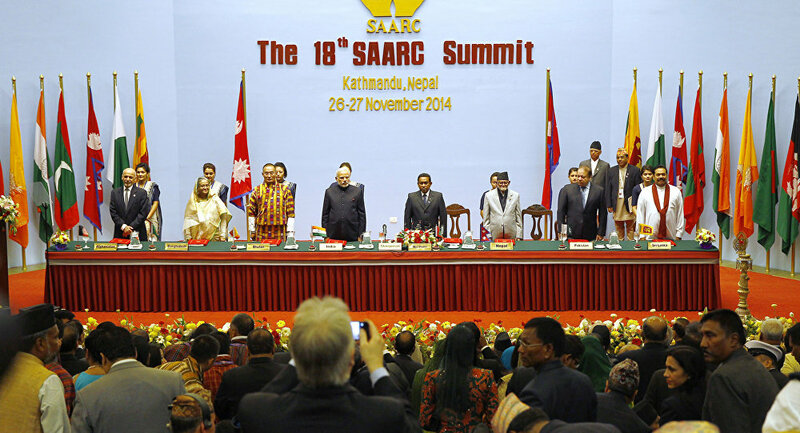 Meanwhile, former Nepali Prime Minister Push Kamal Dahal (Prachanda) has made his country's priorities more clear by asserting during his just-concluded Delhi trip that Nepal wants to "revive" SAARC and underlined to New Delhi that BIMSTEC cannot replace SAARC for regional prosperity. "As the current Chair of another important regional process, namely SAARC, Nepal's desire is to revive it and see an environment conducive for the early convening of the stalled summit. We believe that SAARC and BIMSTEC do not substitute but complement each other," Prachanda said on Friday while delivering a keynote address at the Indian Council of World Affairs in Sapru House in New Delhi. Prachanda also sent a clear message to New Delhi when he added: "Respect for sovereignty, territorial integrity, and non-interference in internal affairs help buttress trust which is absolutely essential to governing a friendly relationship. Let me tell you frankly: small neighbors have some sensitivities that need to be understood and respected."